PAINESVILLE TOWNSHIP - Harley Kuhn has been a tattoo artist for 25 years. He started out as an apprentice under tattoo artist Shawn Ross. Kuhn currently works as a tattoo artist at the Catch 22 Tattoo shop at 1505 Madison Ave.
“You have to start out as an apprentice and it takes two years to do it,” Kuhn said. “It also helps to be artistic. When I was in third grade at Hale Road Elementary, my art teacher, Susan Chaffee, said I draw like an artist. Kuhn is very passionate about his profession. He said tattoos can tell life stories, memorialize something or commemorate where they have traveled or military service. Kuhn named a few tattoo artists that he looked up to when he first started tattooing like Lyle Tuttle who was featured on the cover of Rolling Stone, Philadelphia Eddie, Gil Monte and Sailor Jerry. Eddie Funk aka Crazy Philadelphia Eddie had been tattooing since 1952 in Philadelphia, PA. He has since passed away. Gil Monte has been a tattoo artist since 1990. Kuhn said that Thomas Edison invented the electric pen which is now used to do tattoos. According to the website NYHistory.org, in 1876 Thomas Edison patented an electric pen which was originally designed to be a writing implement. However, it didn’t work out. In 1891 a New York tattoo artist by the name of Samuel F. O’Reilly produced an electric tattoo needle based on Edison’s pen. It enabled speed and precision and changed the way tattoos were done. When asked for the reasons people give when they decide to get a tattoo, Kuhn said it varies. “Someone fresh out of boot camp. Proud to be in the Army, Navy or Marines. For a loved one that has passed away. Birth of a child. Family members who get brother or sister tattoos. A family crest. A lot of law enforcement officers get Saint Michael,” he said. Where a person decides to get a tattoo on their body also varies according to Kuhn. He said it really depends on the person and where they want it. “If you really want to get a tattoo, it doesn’t matter how painful it is, especially if it is something you really want to do and have put thought into it,” Kuhn said. Kuhn is a man who really enjoys his job and truly enjoys working with the other artists at Catch 22. “I think this is the best group of artists I’ve ever worked with - Chris Klee, Doug Flack, Austin Owens, Seth Scott, Victoria Lea, Chad Medena and Shannon Sz,” he said. And he is sure to thank the owners of Catch 22, Brian and Lori Richards. The Richards’ recently added the 1922 Coffee & Brew Shop next to the Catch 22 Tattoo studio. The coffee and brew shop opened a few months ago, and they opened the tattoo shop about two and a half years ago. “We started with the tattoo studio,” Lori Richards said. “Customers would bring people with them to wait while they were getting their tattoos. People would say that they wished there was a coffee place nearby. The coffee shop evolved from feedback from the clients at the tattoo studio. Richards said they serve coffee, sandwiches, pastries, and have a full service bar. On June 26, which was bike night at 1922, at least 300 people were in attendance - officers and bikers - to show their support for Mentor Police Officer Mathew Mazany. Pastor Mike Cole, from Perry, started with a prayer. Then the group payed tribute to Mazany. DJ Jason Lawson provided music at the event. Donated proceeds from the event went to the Mazany family. Anyone considering getting a tattoo should make sure they have an idea of what they want to have done. Remember, tattoos are permanent. Put thought into where you’re going to get the tattoo on your body, the type of tattoo, and why you’re getting the tattoo. It’s important to go to a reputable tattoo shop and artist. Check out social media. Talk to friends. Make sure the tattoo artist is experienced and has gone through an apprenticeship. Ask if they have a portfolio of work they have done. For more information on Catch 22 Tattoo go to their Facebook page or call (440) 358-1511. 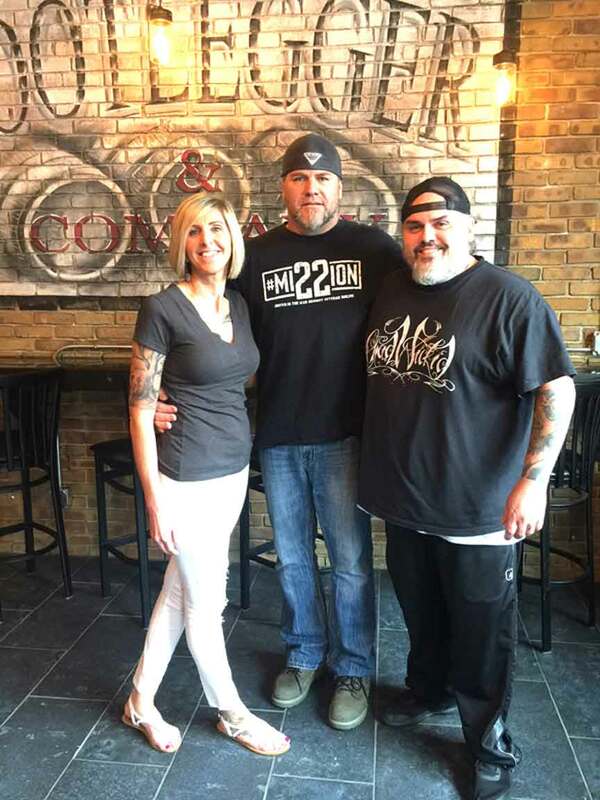 Lori and Brian Richards, owners of 1922 Coffee & Brew and Catch 22 Tattoo, with Harley Kuhn.